"It's not just about the Ramones; it's my whole life story leading up to that, and afterwards. But, y'know, 95 percent of the time I was in a van with those guys, stuck in assigned seats, and you can't jump out the window or anything. So I wanted to tell people what it was really like." An excerpt (full chapter) from the book is available to read here, and an interview with Ramone discussing the book is available to view below. 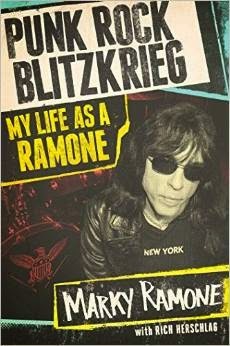 Pre-order Punk Rock Blitzkrieg: My Life As A Ramone from Amazon, Barnes & Noble, Apple, and Pledge Music. Ramone will be hitting the road for a short tour to promote Punk Rock Blitzkrieg: My Life As A Ramone. Dates are posted below. More details about each stop on the tour can be found on Marky Ramone's website.